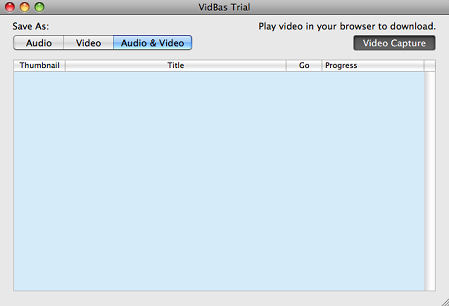 VidBas is a very convenient way to download videos from your browser. VidBas is the best thing to ever happen to downloading! Automatic capturing: Just launch VidBas, open a video in your browser and watch it automatically download! Multi-browser support: Support for Safari, FireFox, Chrome and any other browser. Unlimited simultaneous downloads: Catch as many videos simultaneously as you like. Save videos as MP3, as MP4 or as MP3 and MP4! The program worked remarkably quickly! I like all the features of this program. Especially the high output quality is amazing, and I believe that you can attract more customers. Easy to use and not a CPU hog Fast, efficient, and perfect for getting video downloaded into a format for iTunes in order to transfer to my iPad. Great video downloader for Mac. 5 stars! The program has nice interface. It's easy to use. VidBas downloads ALL videos I tried (and I tried many, including YouTube, Vevo, Hulu, DailyMotion, Vimeo..). With it you can save the output either as video, audio, or both. I had no problems using VidBas on my Mac OS 10.4 at all. Works great! Capibara technology implemented in MovieSherlock and others product is a proprietary property of Capibara Inc, owner of MovieSherlock. We respect our customers and we respect copyrights. Please do not use these products to violate any copyright restrictions that might or might not be in place.